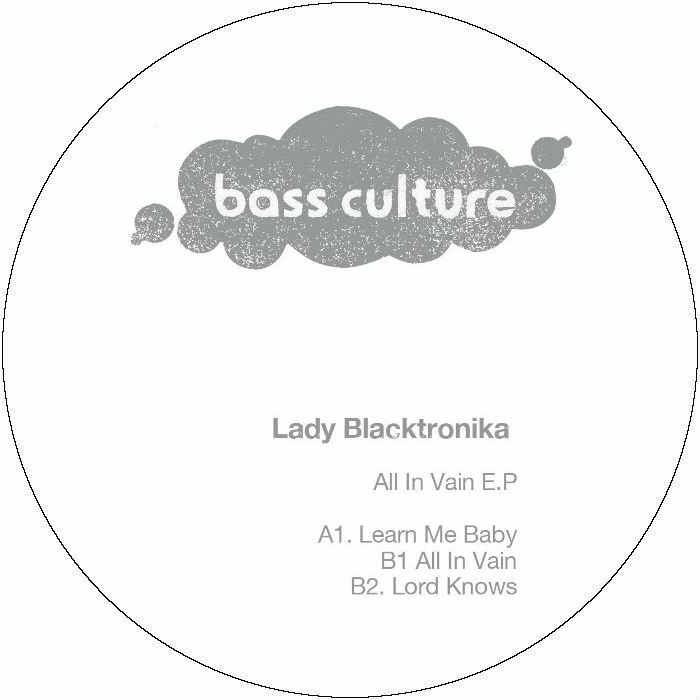 Lady Blacktronika AKA “the first lady of beatdown” brings three solid productions with All In Vain EP, the next instalment on Bass Culture Records. Discovered on Myspace by Mike Huckaby back in 2007, Lady Blacktronika’s sound brings a gritty edge from her street days, while simultaneously oozing a unique female sensitivity. Making an impressive transition from the days when the DJ boys wouldn’t let her play with their toys, she runs multiple labels, Sound Black Recordings, Sound Kemystry and is co-creator of Cocaine Records, as well as releasing on Deep Explorer, Skylax, Underground Quality and now Bass Culture. Jumping straight in with Learn Me Baby, the A side sets the tone with a deep and pounding, powerful groove. The title track takes it up a notch, the most incessant of the package, built for that peak-time dance floor fury. While the techno undertones remain, Lord Knows is a beautiful swirling house number that infuses the ears and body. The common denominator in all cases is the resonating voice of Lady Blacktronika herself, adding the human touch… a touch of soul. “bomb , thanks! !” Dubfire “Smokey, trippy atmospheres Loving this Another great one on Bass Culture” Laurent Garnier “sick tunes in here. thanks” Robert Dietz “Very good Stuff!, my fav is “Leam Me baby”, thanks : )” Franco Cinelli “superb” Roland Appel “Nice EP” Chris Carrier “Great EP. Can I get the WAVs please? Thanks for sending :)” Laura Jones “Learn me baby and lorn known for me. Dope..” DVS1 “ace release, love all 3 tunes” Jacques Renault “Great release” Jan Krueger “learn me baby is my fave, but all in vain is also nice. Will play for sure” Dorian Paic “cool release. will play for sure” Sebo K “Damn… This whole package sounds like a hell of a party!” Kiki “This Ep. Just kills on the floor!!! !” Doc Martin “Learn me Baby for me !” Anja Schneider “heavy. another bomb from BC” Burnski “Learn me is the one, definitely rocking this!” Dan Curtin “Crispy raw grooves, nice one!” Satoshi Tomiie “Bomb ! !” John Dimas “Killer! !” Jimpster “Tight!! Thanks very much. All In Vain… :)” Marcus Barnes “love this whole EP” Luke Solomon “sounds dope!” Phil Weeks “super EP !! dark & groovy the way i like 😉 cheers” Jef K Played by Richie Hawtin & Raresh. This entry was posted on October 28, 2014 at 12:25 and is filed under Release.